Yes, you read right. Never in a million years would I have imagined that one day I would be strolling along Siloso beach clad in a swimming costume, sarong, shades and hat with a photographer by the side snapping away. In any case, I surely wouldn't have landed this sort of deal had it not been for my two lovely girls who looked absolutely ravishing and adorable in their swimming suits. Ariel is dressed in a flamingo bikini with lacy ruffles from Seafolly and Angel in a green polka dotted pineapple rash vest and a bikini bottom from Cotton On Kids. Believe or not, both of them chose their own outfits and I must say they have pretty good taste! 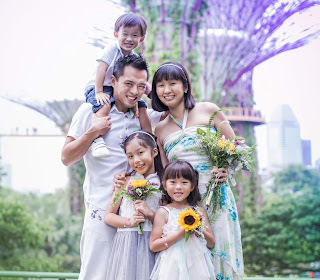 On the day of the photoshoot, we arrived early in Sentosa which was bustling with tourists and families looking to have a good time under the sun on a Sunday morning. I changed into my Zarhara Keyhole Maillot swimsuit from Seafolly which I personally fell in love with when I first saw it. Don't you just find it so summery and cheerful? Just to protect my modesty a little, and also because those stretch marks and flabby thighs are not much to look at, I requested for a sarong and loved the look of this Splendour Sarong Raspberry from Seafolly. Once we settled down, it was time for make-up! Yes, beach photoshoot also must have make-up but we chose to go for the bare minimum and be as natural as possible. It was a scorching day and from the way I constantly perspired, I felt quite sure that I would ruin the makeup in a matter of minutes. Anyway, the kids were happily playing with the sand but halfway through the make-up, Ariel came running up saying "Poo, poo!" 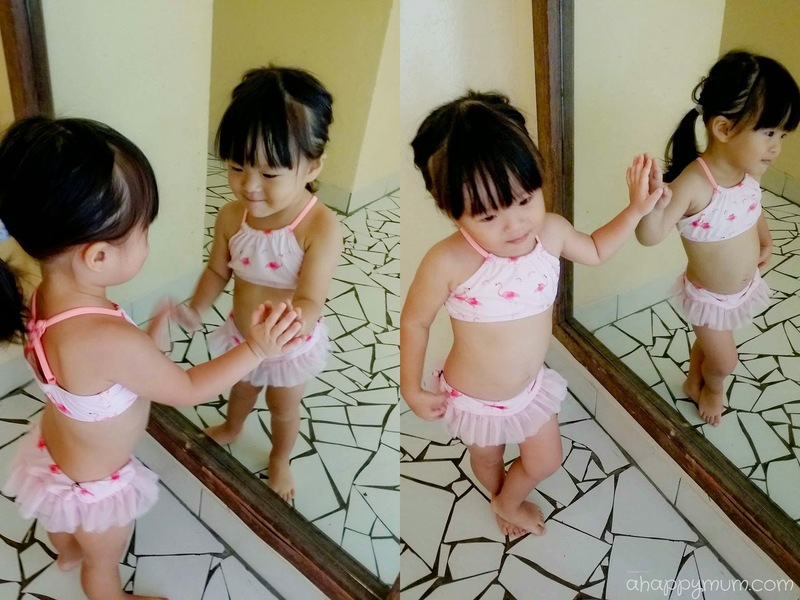 Obviously she did not have on any diapers since she was dressed in her bathing suit already. So with my hair in a mess and face half done, I rushed to bring her to the loo and that was when I discovered that she had already pooped in her pants. I started to panic a little and in between cleaning her up and washing her soiled bikini bottom, I couldn't help but find it quite hysterical and started laughing. This funny little girl just never fails to surprise me every day, right? Thankfully, it was quite easy to wash away the poo and dry her bikini bottom with the hand dryer. Once we were all done, it was time to bring it on! Check out how delighted and happy Ariel looked in her shades! You know, I must say I love how round, bulging tummies look especially cute on toddlers! As for Angel, this girl has been trained up well over the years and I love how she never fails to give a stunning, wide smile for the camera. The theme of the photoshoot was to bring out the fun of summer holidays and to be honest, it really wasn't that hard because in reality, we do love to have a picnic or play by the beach! So, that essentially meant that all we had to do was to - be us. The crew was kind to provide picnic goodies for us like macaroons, cookies, biscuits and fruits. They thought my kids would have loved to eat the snacks but I knew better. They attacked the strawberries and ate almost every single of them in just a few minutes! Look, we even did 'strawberry cheers'! We also had to take turns to do some solo shots and I thought it would take quite a while to accomplish. However, thanks to the efficiency of the photographer and full-fledged cooperation from the kids, each of us only took 5-10 minutes! Yes, even little Ariel was able to understand instructions and did everything that she was told. Mummy is so proud of you, my dear! I especially loved the pictures of the girls and felt really thankful for the kind weather, warm waters and friendly crew which made these precious keepsakes possible. I had thought that the shoot would last half a day or so but in the end, it took less than two hours to complete! In fact, the kids were so eager to continue playing and we decided to stay on for a few more hours to truly enjoy our girls day out at the beach. These shots of us playing with the beach ball were some of my favourites of the day! It's not hard to tell that the kids were really having a good time, right? If the pictures were meant to illustrate hot bikini babes under the sun, we would have fallen short. But if they were to showcase a happy family just having fun and enjoying life, I kind of think we nailed it. Thanks to everyone who made this photoshoot opportunity possible for us! We had a blast and totally enjoyed this experience from start to end! Summer holidays rock! For those of you who love to shop at Wisma Atria, these contests and promotions might excite you! 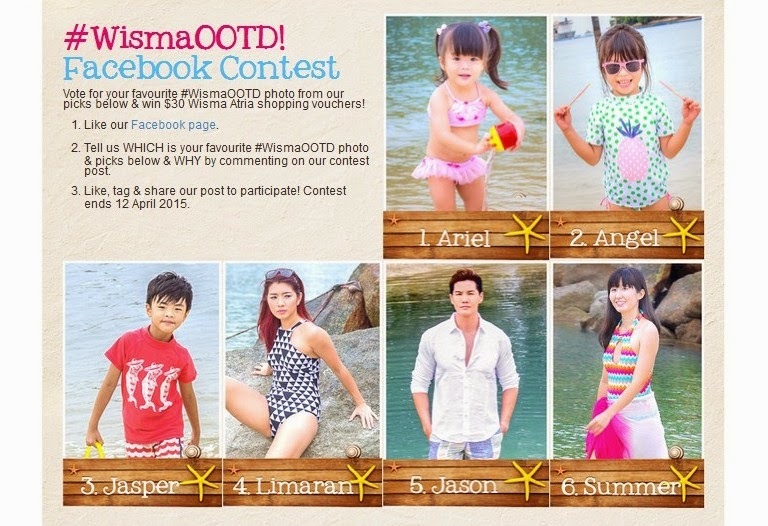 Vote for your favourite #WismaOOTD photo and win $30 Wisma Atria shopping vouchers! You don't have to vote for me but I'm hoping you'll like one of the girls' outfits! 1. Like Wisma Atria's Facebook page here. 2. 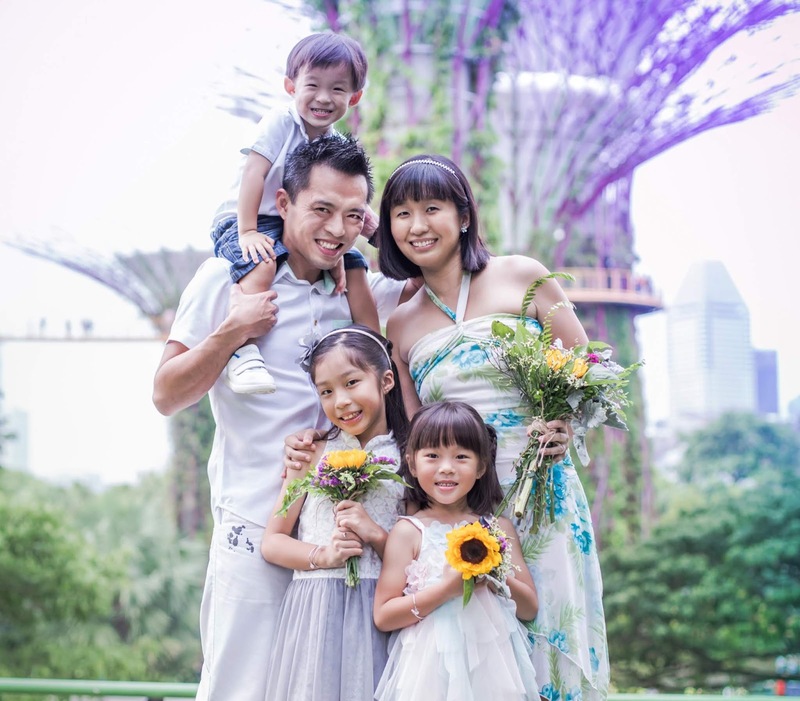 State your favourite #WISMAOOTD photo and why by commenting on the contest post. 3. Like, tag and share the post to participate! Contest ends 12 April 2015. Click HERE to view the full editorial post featuring me and my kids. Woohoo! Shop at Wisma Atria with minimum spend of $200 and stand to win a trip to Gaya Island Resort - a 5-star luxury resort in Malaysia, or a PS3 (500GB) Charcoal Black! Promotion ends 5 April. Find out details on how you can win here. Disclosure: We were compensated for the photoshoot but not for this blog post. This was written because I wanted to record this experience and share these happy moments. All swimsuits are sponsored and photographs provided by OCG. All opinions are my own.